to ferry you on a jaunt to Zion. Join me for donuts? “a ton of them.” Even so, I want to drink your jazzy stars. about all the wrong things. My tan’s gone dun. I’m due for an audit. What’s the use? Longing’s just an unplucked oud. a junta of what we’d once agreed to adjoin. nod, if you have one iota of mercy. 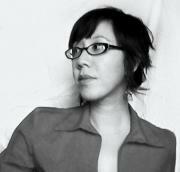 Sandra M. Yee is a Callaloo and Kundiman fellow with a 2013 MFA from Virginia Tech. She is still waiting for Junot Díaz to remember that he once called her his ideal MFA student.